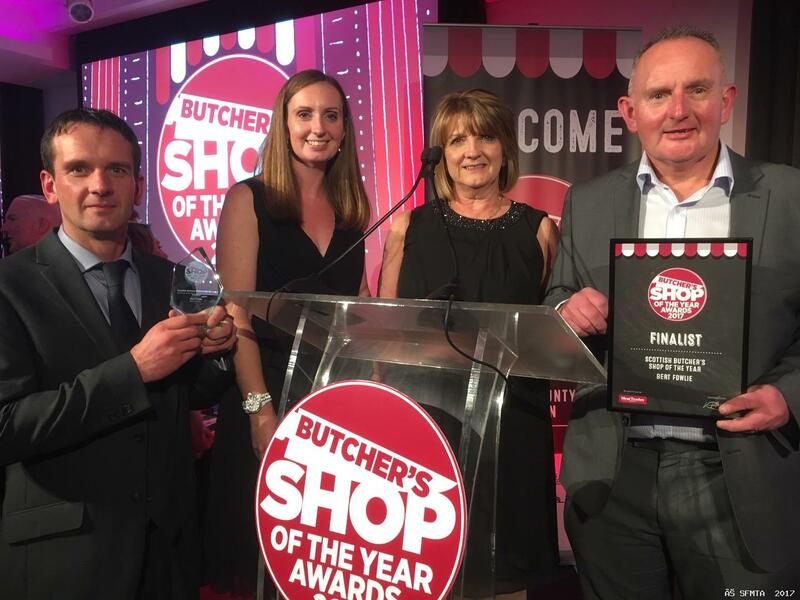 Bert Fowlie in Strichen, Aberdeenshire was named 2017 Scottish Butchers Shop of the Year at the Butchers Shop of the Year Awards at County Hall, London. Hebbie Fowlie was punching the air in delight when his business was named Scottish Butchers Shop of the Year at the prestigious industry awards luncheon held at County Hall in London on Monday. He was one of three Scottish finalists selected to attend and he wasn`t going to hide his emotions. He claimed that he was "overly ecstatic" but wanted to pay tribute to all in his team who made the award possible. "We have great staff, the longest for over twenty years but some for fifteen and ten. They have built up the business with the family. 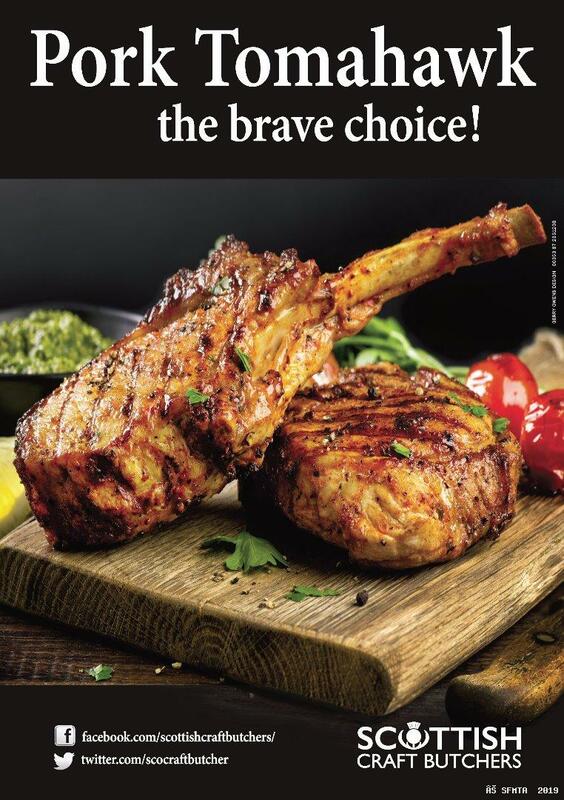 We have been innovative, we have changed the business and in this trade nowadays, all butchers are the same - they have to change with the times. They have to come up with new products and do new things to bring the customer in. "As far as this award is concerned it is a fantastic thing for us. We are just a small business in a small village. Strichen has just a population of 1200 people but by god we did it! We are fair chuffed and over the moon." "The judge was very interested in our business, he was interested in the type of beef we had. He was surprised how lean our beef was, that is what my customer like and that is what they come to me for, so we stay doing what we are doing. "We are involved with the community. We have helped develop the community park, we have provided a couple of defibrillators and we interact a lot with the village. My son Gavin, my daughter Donna and my wife Eileen are involved in different things. "I believe that had a lot to do with it as well. We are not just a counter, we are a community based business." The strength of the Fowlie business appears to be the sum of lots of things all done right. It has made huge strides forward since being founded by Hebbie`s father Bert, in 1955. It now sustains 30 members of staff and four family members. "We have changed a lot since that time. Years ago it was freezer orders but today people like to buy fresh. They like our kitchen Ready products and they have been a huge success." Asked is there was one thing that he could single out as being the major contributor to this award, Hebbie had an instant answer "passion". "If you have a passion for your business you will do it. You have to be different, you have got to have an interest in your business and move with the times. I have done it for 44 years but if you have passion and you love your job you will enjoy the kick for the customer to share our success." Those customers enjoy the experience of shopping at Fowlies where the environment is contemporary, uncluttered and attractive. The front shop went through a major refurbishment seven years now and there are many comments to say that it looked more like a delicatessen than a butchers. "That is just changing with the times. To survive you have got to change." Hebbie has always been helped by his wife Eileen and their daughter who joined in 2007 and then five years later, their son have also decided to leave their jobs to enter the family business. "My daughter worked in an office job in the oil industry, my son, he was a joiner but they have come back and they have the same passion as I have. They have the same ethos, they are hard working, they like to please the customer and I think they will do very well. Hopefully they will keep me in the manner that I am accustomed to when I retire." "It does not happen itself. You have to put a lot of work into it, sacrifice one or two things - late nights, early mornings and working on Sundays. These are things that people do not realise but days like this makes it all worthwhile. It was good of the Meat Trades Journal to put up this award and thanks to the Federation for all the support that we have had."